I don’t tend to do landscapes so much but I thought I really should try and push myself a little more in that direction, still with wildlife at the heart of what I do. 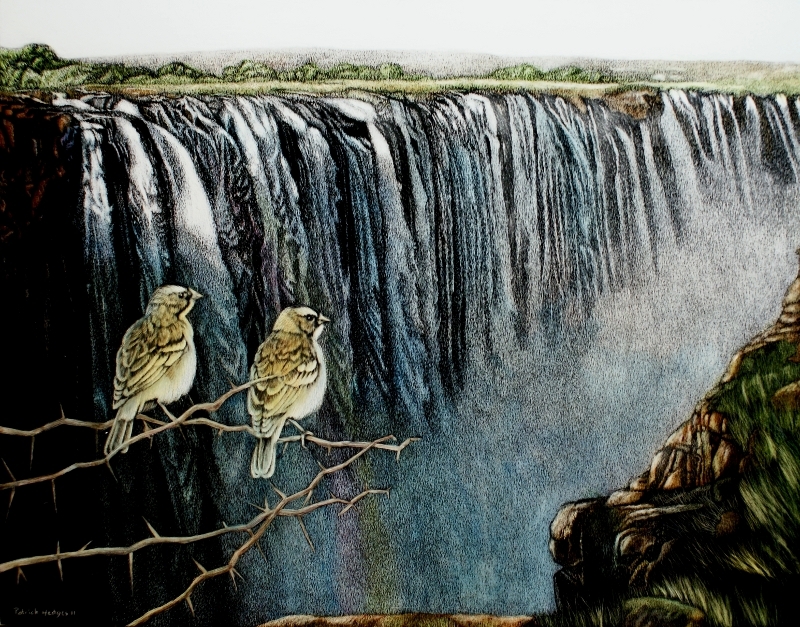 In 2009 I was in Zimbabwe and Zambia where I saw the falls and these lovely birds. I’ve tried to show the lushness of Victoria Falls, a magnificent icon of Africa, with a hint of a rainbow, juxtaposed against the harshness of the tough life of the inhabitants, represented by the weavers’ natural habitat, this thornbush. It’s scratchboard coloured with Mastisse inks, 11″ x 14″ and I’ve used my fibreglass brush for the birds and a scalpel for the landscape done in my trusty squiggly style. Victoria Falls is the most amazing place with it’s booming noise of the falls, spray, rainbows and a surprising lack of people wandering all over it, a far cry from that other amazing place, Niagara, where you literally have to fight to get a good view. 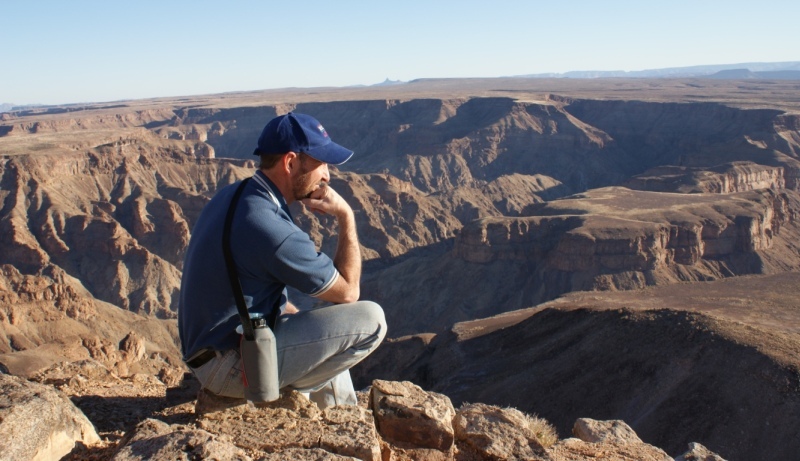 That’s the thing with Africa, if you do some work you can see the most amazing places and still get away from people (if you wish to) as evidenced by Africa’s version of the Grand Canyon, Fish River Canyon in Namibia. It even looks like the Grand Canyon but I would have seen a maximum of ten other people all day (other than the group with me). 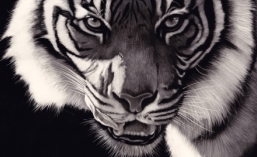 Having said that, I hope to visit the US next year to coincide with the first exhibition held by the International Society of Scratchboard Artists (more info on that later) and I can’t wait to see more of America’s natural wonderland. I’ve been over three times before and absolutely love the place. Patrick. Your landscape turned out great! That will be so exciting if you get to come over to the US next summer. I am hoping to get to go to Austin as well. I can’t wait to meet you and all the other scratchers I have met on Wetcanvas.